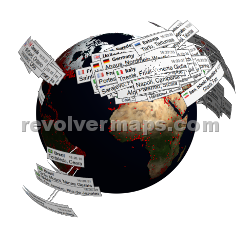 RevolverMaps has run IPv4 and IPv6 in parallel for a while now. Users with an IPv6 connection were located on the basis of their IPv6 address. In fact the accuracy seems to be currently higher when users are located by their IPv4 address. For this reason IPv6 geolocation has been deactivated for an indefinite period. It will be reactivated as soon as the geolocation data for IPv6 addresses provides better accuracy. Added responsive dimensions to RevolverMaps Mini GL. 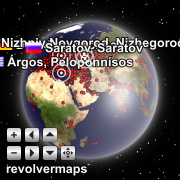 Completed HiDPI (retina) support for RevolverMaps Standard GL. The visible part of this widget is just a text link. 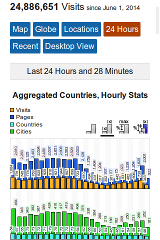 A click on the link opens the public live statistics page providing detailed information on your visitors. Your CSS rules will apply to the text link. Improved: Sharpness for the Smallest RevolverMaps Widget! Installations of this widget being not much older than about 3 years will receive this update automatically (Note that the old version may still be served by your browser cache...). If you have an older installation you can upgrade: Make your new button, follow these instructions: How to update my existing RevolverMaps Widget.... Please read the instructions carefully before starting the procedure! The essential social media share buttons for your website. More information at www.buttons.social. Beyond the Maps: Revolversweeper is Here! A 3D variant of the game Minesweeper. Play it in your web browser! The mobile version of the live statistics page - recently launched - has been completed with the 24 hours charts. Finally the classic mini globe has been ported from Flash to HTML5. 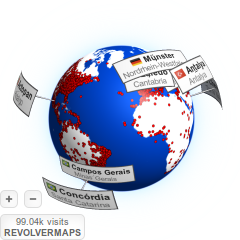 All RevolverMaps widgets are now available as an HTML5 implementation. The improved mini globe is optimized for high DPI displays and supports the new RevolverMaps energy saving techniques. The Flash globe still is displayed as fallback if the client system doesn't meet the minimum requirements for the new globe. The good old Flash globe has been ported to HTML5. The new version looks like the old globe with less aliasing. In addition it supports touch gestures, UTF-8 text labels, it saves energy (lazy resource loading, no rendering if it's not visible), brings back the mouse wheel support and it looks great on high DPI displays. Added 2D labels to RevolverMaps Standard GL. The administrative divisions of several countries have been revised and updated. Latin script based location names are now available as UTF-8 character strings with correct diacritics. The RevolverMaps service supports IPv6 – the upcoming internet protocol – in parallel to IPv4 now. This will ensure a good accuracy of the geolocation in the future. 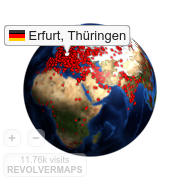 Added HiDPI (retina) support to RevolverMaps Mini GL. 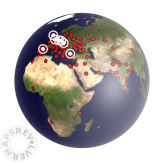 ... is here, displaying the local time of several cities on a 3D realtime globe. This refurbished version of the 2D widget provides lots of new customization options. It's HTML5 based, responsive and retina optimized. The RevolverMaps website got a new face today. Report a problem. 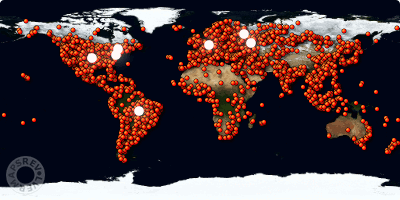 Note that the classic Java globe is no longer the default 3D view at the live statistics page. 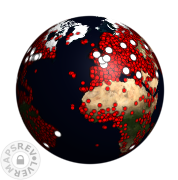 But you can reactivate it in the bottom toolbar of the new 3D view GLobe (this button: ). New Java versions may prevent the execution of the Java applet. Please find more information and a workaround here. A downtime of several hours affected parts of the website as well as several users of the service yesterday. Please clear your browser cache if your stats are not showing up correctly. This new widget provides the same technical features as the recently published RevolverMaps Mini GL, please see the next entry. The collection of the visitor data is designed to work in every and even very old browser. Note: As the most hardware accelerated 3D applications the globe also depends on the graphics hardware and the graphics driver. The globe will be displayed in Opera, Safari and Internet Explorer as soon as these browsers provide WebGL as a non experimental feature. A longer downtime affected several users of the service today. The cause was a broken hardware. If your stats are not showing up correctly please clear browser cache and try again. The new 3D view GLobe provides a wider range of features and takes advantage of the hardware acceleration through the WebGL API. It's supposed to replace the good old Java globe. To activate it go to the Live Statistics Page and select the 3D view. The button in the toolbar at the bottom of the old globe appears if your system is ready for WebGL. It links to the new globe. The button will restore the classic Java globe. GLobe was successfully tested on systems with configurations listed in the table on the right. See the FAQ for more information about WebGL and a list of compatible browsers.